I went through the whole tutorial series - really great job! Expecially for a beginner person like me: it really let me understand how sensor fusion can work and how to use it. Great tutorial series! One of the best out there! I have one small question. You are combining data from three different sensors. Android does not synchronize the data from them so they have different timestamps. 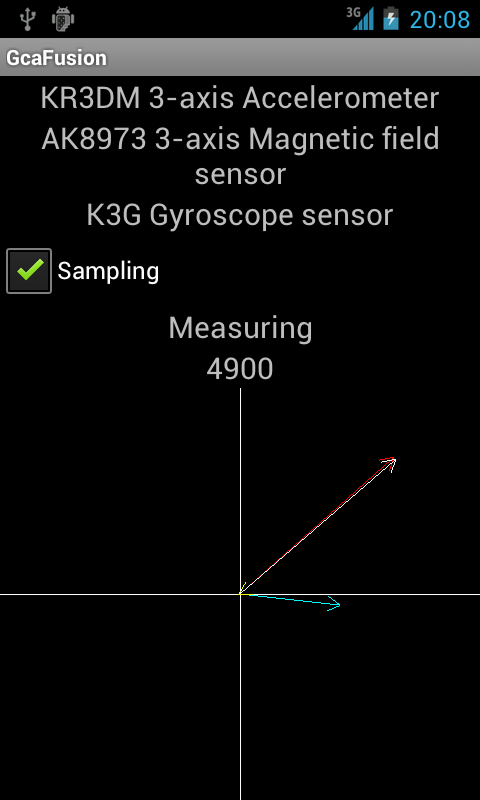 Also quite different frequency (accelerometer is probably the fastest one). Is it not a problem when fusing sensors data? Aren't there any need for some kind of synchronization (like via interpolation or something)? today: generally speaking it could be a problem. But look at the realities: we are talking about human movements sampled with about 10-50 Hz (depending on the selected sampling freqency). 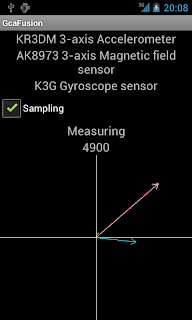 Gyroscope sampling rate can be as high as 600 Hz in some models. Compared to the speed of the timing of the measured signals, the difference among sensor data timestamps can be neglected. Anonymous: "Just wanted to let you know that seeing code for this last one level of data fusion would be like sensor programming heaven;)"
What do you mean? The example program is always available for download. What I meant whas (I thought code is still in development) the fact that - at least here - when I download the .zip file the archive seems to be empty.. Anonymous, that's a Windows Explorer thing. I just got report about another ZIP archive I published. I use 7-Zip on Windows, that opens the archive without problem. Also, there's no problem on Linux or Mac. The archive was created with Eclipse's Export Archive file feature on Linux, I can't imagine what ZIP wizardry could be at play here. Anyway, I just tried on Windows with 7-Zip and it works. If I am not mistaken, in a previous example application you used wavelet transforms to detect patterns of motion (walk, run, shake) on an Android phone. It looks like with GCAFusion, you have an application which will detect motion more accurately using input from multiple sensors. Could you use GCAFusion to detect motion patterns? Would you use the same approach (wavelet transforms) as in the accel application? I would appreciate it if you could give me some pointers on how to do that to help me get started. I think I solved the problem I asked about in the message I posted on January 27. My next problem is how to make sensor data available to worker threads in my main application. I tried a number of ways. None of them work. To produce and manage worker threads (I have a quite a few), I use completion services, future, and callable facilities. When I start my worker thread execution, the sensor sampling service seems to stop running. Do you have any ideas as to how to resolve my problem? Thanks for the offer to take a look at my code. I think I resolved the problme by having the sensor sampling service run in its own process. Now, I have too make sure the various functions in my application (wifi scan processing, sensor data gathering, and location analysis don't get in each other's way (using synchronization). At present, my code is not very readable and is pretty big. I am a little reluctant to send it to you. At some point, I would love to get your take on what I am doing, especially as it relates to movement detection (especially walking movement). I'll stay in touch. I hope you won't mind. Alex, if there's access to any context variable that is implemented in an energy-efficient way (i.e. it is not the main processor that calculates it) then it is preferable to use that method and not something that is implemented on the main processor. Those multi-core processors with GHz clock frequency consume a lot of power. Having a dedicated chip (e.g. microcontroller) saves a lot of battery power. You may have seen the Google Tango phone announcement. I wonder how much of the sensor data processing in Tango phones is offloaded to dedicated hardware (the approach you suggest). I understand the benefit of the approach you suggest. However, I would not want to lose control over the processing of sensor data, and the algorithms used to process that data. At this point, I want to continue to pursue the software based approach you have used in your software. Alex, wrt. your comments about main CPU vs. dedicated hardware. Of course, when you experiment with an algorithm, it is advisable to implement it on the most flexible platform, which in case of Android is the generic Android Java application model. Just don't be surprised when that implementation strategy is hard to turn into a consumer product. It is not by chance that in an average smartphone, no aspect of the cellular network communication is implemented by the main processor, the whole functionality is offloaded to a dedicated communication chip. I don't know anything about the Tango, but I expect that most of the signal processing is offloaded to dedicated chips or maybe to the GPU. If you want to do step counting, I wrote a paper about it. I am happy to help if you have any problem with that prototype (the prototype was tested on just one platform). It's been a longg time since we last chatted adn, understandably, you probably do not remember me. I developed a technology for indood/outdoor location tracking. Since it's not may "day job", I spent as much time as I could on it but not full time. I have assembled a small team to take the next step. The core indoor/outdoor location tracking function is implemented and running farily successfully. One component that I need to add is the detection and recording of a user's movement and stationary periods. My plan is to use the sampling service you implemented in your shake-walk-run demo application. When I ran the shake-walk-run demo app a couple of years ago it recorded periods of movement and stasis farily well. I recently installed the shake-walk-run app on my Nexus 6 and it does not seem to record periods of movement and stasis as well. Is it possible that this is due to the hardware on the Nexus 6, and the fact that the walking triggering thresholds in the "processWalking" method are not correct? I have looked at the w3p, w4p, and w5p values reported when the shake-walk-run demo app runs on my Nexus 6 and I am walking. They rarely meet the test that would set the value of "nowWalking" to "true"
The most evident source of the problem may be the sampling frequency. This is an old presentation but if you look at slides 12 and 13, I guess you figure out what the problem is. That prototype was only tuned to Nexus 1's sampling frequency. Any different sampling frequency will change the filter bands therefore the "walk" and "run" frequencies will not match those that are defined in the app. The solution is to implement a sampling frequency calibration step but that is completely missing from that prototype application. I looked at the two slides you refer to above. I see what you mean! I suspected the problem was related to differences in hardware among devices. In your estimation, roughly speaking, how complicated would it be to develop the sampling frequency calibration module? For our application, it would need to run once (or infrequently) and be as transparent to the user as possible. In the current prototype application is the tuning of the sampling frequency to work on the Nexus 1 reflected in the values of the wavelet filters? By the way, I thought that as an alternative, I could try and use a steps application (e.g. your prorotype) or the Android buil-in step related functions. However, for our application fairly accurate tracking of movement is more important than the counting of steps (although knowing the number of steps taken is a nice-to-have). Two things need to be done. First, you have to measure the sampling frequency (i.e. what FASTEST mean on a specific phone). That's not hard, you initiate the sampling and count, how many samples are captured in a given time period. Then based on the sampling frequency, you need to recalculate the wavelet filter parameters. This step essentially expresses the relationship of a "walking" or "running" frequency (e.g. 1 Hz or 3 Hz) compared to the sampling frequency. The wavelet calculation routines are all available in the example program of the blog post above (implemented in Python). Regarding your alternative idea. Generally speaking using an algorithm (e.g. step counter) built into the platform is more advantageous than implementing it yourself except if you are researching or experimenting with new algorithms. The reason is power consumption. In modern mobile devices, the sensor signals are pre-processed by quite sophisticated specialized microcontrollers which operate very power-efficiently. Meanwhile the main CPU of the device that is available for executing user programs is a battery hog. This means that any sensor processing that you implement yourself (particularly if executed in the background) is going to draw on the battery very heavily. The smartphone is OK for putting together prototypes quickly but if you think about a product, you probably want to build a custom hardware and that's not terribly hard. These guys went through the same process. Thanks for the pointers/instructions. I will work on that. I hope you won't mind if I have questions as I work on the implementatiion. With regards to the "step counting" alternative, I see your point. It makes good sense for a specialized solution. For a general purpose solution, one that would work on any smartphone and be used by consumers (and retailers) to get context relevant information based on location (indoor/outdoor), specialized hardware creates another hurdle to acceptance, unfortunately. So, it's a trade-off between a technically better solution and one that is "universally" available, i.e. one part of the OS. Nearly by definition, the "standard" step counting function built into the OS is less than optimal. In addition, using it makes the application dependent on it. My aplication's need is to provide sufficiently reliable information about a user's path clearly identifying periods of movement and periods of rest. If a "home grown" iplementation does that, I would prefer it to the OS built-in function that would give me the same information as I would be less dependent on the OS and its developers (Google). The additional benefit of using a home grown solution is that it does not preclude future development of specialized add-on hardware at some point in the future. This is why I am experimenting with your algorithms. They are based on some solid research and, although the implementations are prototypes, they seem to work reasonably well. The key is for me to make sure that they run "equally" well on a wide range of smartphones. Does this make sense? I would appreciate your feedback. Sure, I am ready to answer your questions. If you send them by e-mail (gaborpaller at gmail.com) then it's a safer way to get a timely response. There is one thing that people attempted wrt. indoor positioning, that's location tracking with the help of dead reckoning (using the step counter as distance measurement and compass or gyroscope as direction measurement). Now that method is so unreliable that it won't work for ordinary users (although there's some success in laboratory setup). For location tracking, you need to use beacons, e.g. BLE beacons. I agree that using the dead reckoning approach to determine a user's location (indoor/outdoor) at this point in time does not seem work (sufficiently reliably and accurately). Our technology uses RSSI (from WiFi APs, BLE beacons, or cell towers) to arrive at a fairly accurate estimate of a user's location (indoor/outdoor). With regards to the moving/at-rest tracking function, the goal is to be able to tell reliably when the user is moving and when he/she is not, and for how long. The location tracking function can tell me where the user is both in relative and absolute terms. If I know when the user is moving and when he/she is not, I can begin to derive a fairly good "map" of a user's "interests". Note that my application is user centric not retailer centric. Given this goal, I think that the reliability and accuracy threshold for the moving/at-rest tracking function is not very high, even taking into account the issues you (very) correctly raise. I really appreciate your availability to talk about this. I value your opinion. I will keep you updated on our progress.